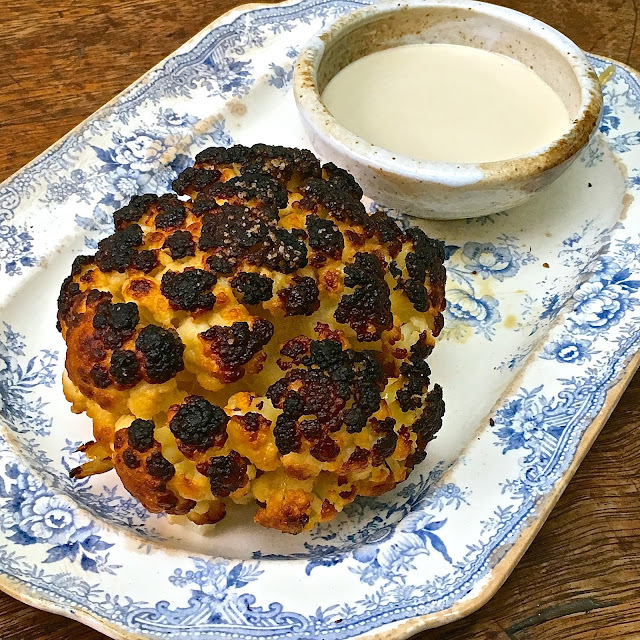 The London Foodie: A Recipe for the Best Burnt Cauliflower You Will Ever Taste! A Recipe for the Best Burnt Cauliflower You Will Ever Taste! Israeli food is fresh, gutsy and vibrant and having spent a couple of weeks eating my way around this wonderful country as part of Vibe Israel Food Tour of 2016, I soon became fascinated (if slightly obsessed) by it. As a chef, food & travel writer, I can honestly say that Israel has been one of the most inspiring culinary destinations I have visited in recent years. Israelis place great importance on good quality vegetables and how these are prepared; vegetables play a major role in any Israeli meal from breakfast to lunch and dinner. I was intrigued by some of their cooking techniques (they make extensive use of char-grilling), and also by their clever use of Middle Eastern spices, salted cheeses and yoghurts, lemony dressings and nutty tahini, elevating some of the simplest ingredients to completely new levels. I can say that this trip made me look at vegetables in a totally different light. 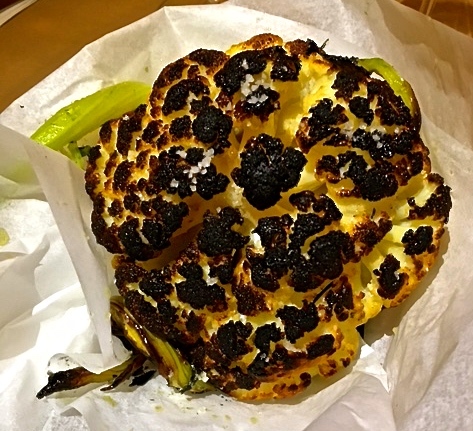 Take for example Eyal Shani’s burnt cauliflower – who would have thought you needed a recipe to burn cauliflower? Well apparently you do! One of the restaurants we got to visit in Tel Aviv during our trip was North Abraxas owned by celebrity chef Eyal Shani (reviewed here). Here we tried his signature burnt cauliflower, whose recipe he was kind enough to share with me. I have tried this at home in London on a number of occasions, and it still impresses me every time. I love how such an inexpensive and ordinary vegetable can be transformed into something so utterly delicious. We have all tried to be clever about cauliflower – we have added bacon, or baked it with tons of cheese or smothered it with curry sauce, but this recipe is all about the humble veg and it alone, with nothing else added but olive oil and salt. It is a winner of a recipe, dead easy to prepare and super quick too. I hope you will give it a try! 1. Pre-heat the oven to its highest setting (300°C or higher if possible). If your oven temperature does not go this high, you will need to use the grill at the end of the cooking process. 2. Fill a pan (large enough to take the entire cauliflower) with salted water (10g salt/litre water). Bring it to boil, then add the whole cauliflower to the pan and simmer for 8-10 minutes until softened. 3. Carefully remove the cauliflower from the pan and drain it over a colander for 10 minutes. 4. 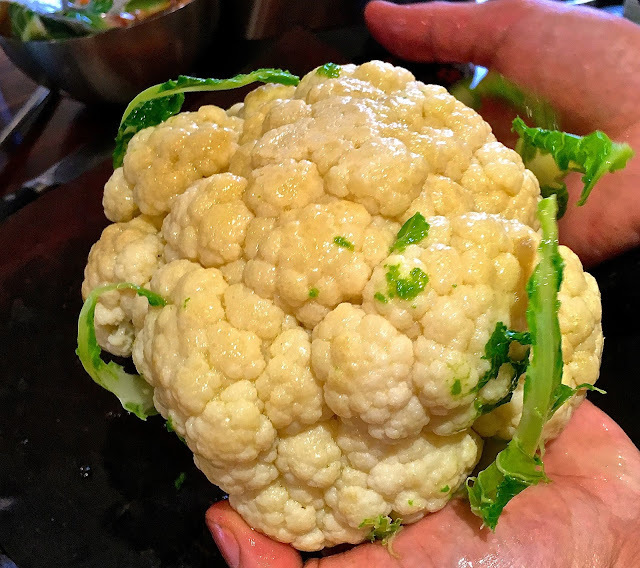 Using your hands, gently baste the entire cauliflower head with the extra virgin olive oil, season with the Malden sea salt and fresh ground pepper to taste. 5. Place the cauliflower (head side up) on a baking tin lined with greaseproof paper. Cook it in the pre-heated oven for 20-30 minutes or until blackened. If the cauliflower is not thoroughly blackened (because your oven is not hot enough), you may use the grill – place the cauliflower under the grill and let it burn for 3-5 minutes, carefully rotating it so that the entire upper part of the cauliflower is caramelized. 6. While the cauliflower is in the oven, prepare the tahini dressing – in a bowl add the tahini, salt, crushed garlic and lemon juice, then start adding the water little by little mixing vigorously as you do to incorporate it into the mix. The mix will initially curdle but do not worry, continue adding more water and mixing all the time, it will bind again. Add enough water until it has the consistency of double cream, check for seasoning and adjust if necessary. 7. Serve the burnt cauliflower whilst hot with the lemony tahini dressing. 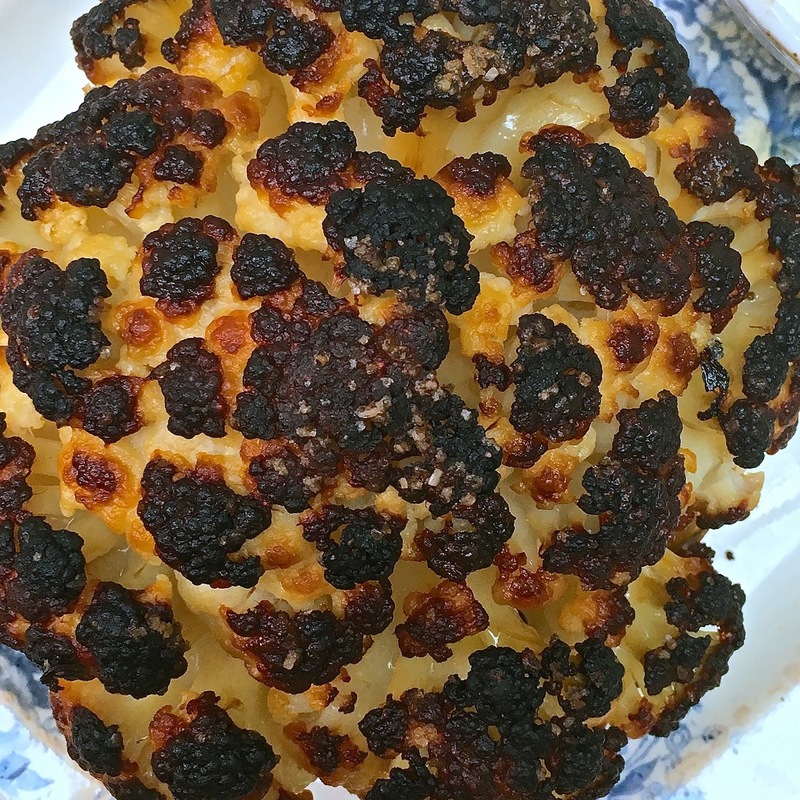 This burnt cauliflower dish was so easy to make and you totally sold me with those gorgeous photos. My son absolutely loved it and it allowed us to spend time together so it was a win win. Thanks for sharing this. @ Muriel - let me know how you get on Muriel, see you at the supper club soon! @ David - what a lovely message David, thank you! I am so happy to hear this and am glad you got to try the recipe with your son! It was very good and I'll do it again for sure. I am really surprised and convinced by your grain processing!